Upper Works to Lake Colden: Leaving the parking lot at the extreme north end of Upper Works Road we hit the Calamity Brook Trail. After an almost immediate wrong turn that took us down to the lake shore we got back on the Calamity Brook Trail and were off for Lake Colden. The first 2 miles were easy grade and extremely well maintained. But it was wet and the mosquitoes and gnats were actually quite bad. Thank goodness for Cutter's! Then the grade picked up substantially and the trail got quite rocky. With full packs that was less fun than it could have been, but overall it wasn't bad. Unfortunately, it was a bit harder on Kristy given that she wasn't feeling particularly good at the beginning of the trail due to the pregnancy. We were unsure enough of the the trail ahead of us and the time remaining before dark that we were pushing hard and blew right past Calamity Pond without noticing it. At about the 5 mile mark we hit Flowed Lands Pond and the McLean LeanTo. Kristy was feeling pretty beat at this point and it was a reasonable stopping point because our original plan included Mount Marshall, the herd path for which starts at Flowed Lands and the McLean LeanTo. The light intermittent rain we'd experienced along the way so far also decided to get a bit heavier and steady at this point. Luckily for us, as it turns out, the LeanTo was occupied and although we'd brought our tents we had really hoped to get a LeanTo on this trip. So it was easier to convince ourselves to push on to Lake Colden. The trail from McLean LeanTo to Lake Colden, while extremely well maintained, is actually more than a little difficult. There is a fairly rapid drop in elevation leading Northeast from Flowed Lands and that plus a little more must be regained to reach Lake Colden. The overall grade is not terrible, but there are a lot of 4 to 8 foot rock scrambles along the way that were not a lot of fun with full packs. But nothing really bad. We reached the Lake Colden Dam at about 1930 with a good two hours remaining before full dark. The LeanTo East of the Dam was full, but there is another LeanTo just Northwest of the Dam that had one hiker in residence. He was still out on the trail when we arrived and started setting up our "camp". The sky looked menacing but the rain let up after we'd arrived. Lake Colden LeanTo: Located next to the lake we had great access to water and were able to enjoy a nice hot meal before dark. Our LeanTo companion arrived back at the LeanTo about an hour after we arrived and and we talked about his day's hike and all of our hiking plans for the next day before bunking down. We enjoyed reading some of the log books in the LeanTo - unfortunately they are filled with mostly very sophomoric gibberish as each correspondent attempts to out-absurd the previous. Opalescent River Trail to Uphill LeanTo: We were up about 0530 and heading up the hill to retrieve our food we saw that one of the bear canisters of the other campers in the area had been broken into. Bear canisters are now required in the Eastern Peaks from 30 April to 1 November and that is a very good thing. But them thar bars are wily! The unlucky camper had a Bear Vault 500 that Adirondacks Black Bears have cracked the code on. If you're heading into the High Peaks region, definitely get a Garcia bear canister. It's the only canister that the New York State Department of Environmental Conservation will rent you if you show up to camp without one. 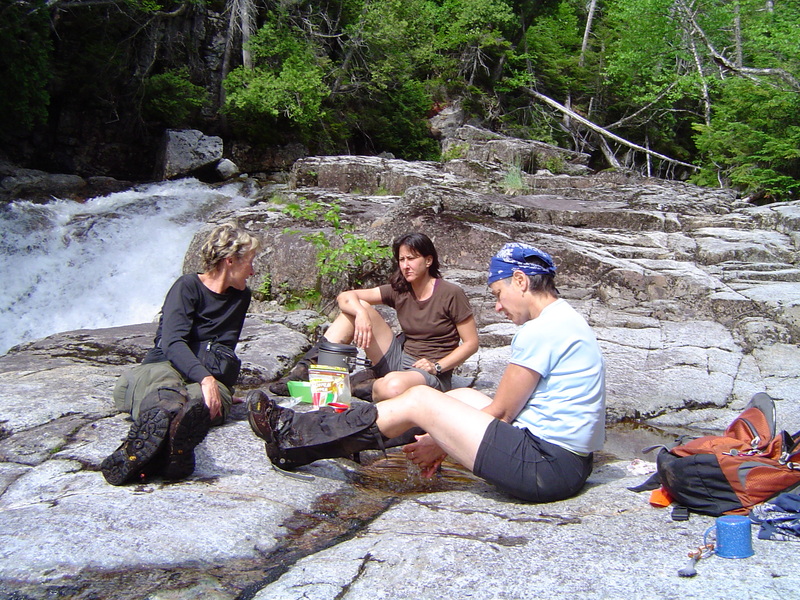 After Pop-Tarts and readying our packs we were off on the Opalescent River Trail. This trail is extremely well worn but can be a patience builder. The first half mile is largely along the Opalescent River and is quite steep. As the trail leaves the brook the ascent continues at a fairly steep clip. The trail, again, is very well worn but it's a frustrating hike due to the abundance of rocks and tree roots criss-crossing the path. The growth of either side of the trail is also quite close resulting in persistent brushing against limbs along the way. The last quarter mile or so opens up a bit more until reaching the trail head to the herd path that initially follows Uphill Brook. Uphill Brook Herd Path to Mount Redfield: The herd path itself is well established. The grade starts out steep and grows gradually steeper all the way up to the area of the peak. The total ascent from the herd path trail head is about 1400 feet with a linear distance hike of about 1.2 miles for an average grade of about 14%. 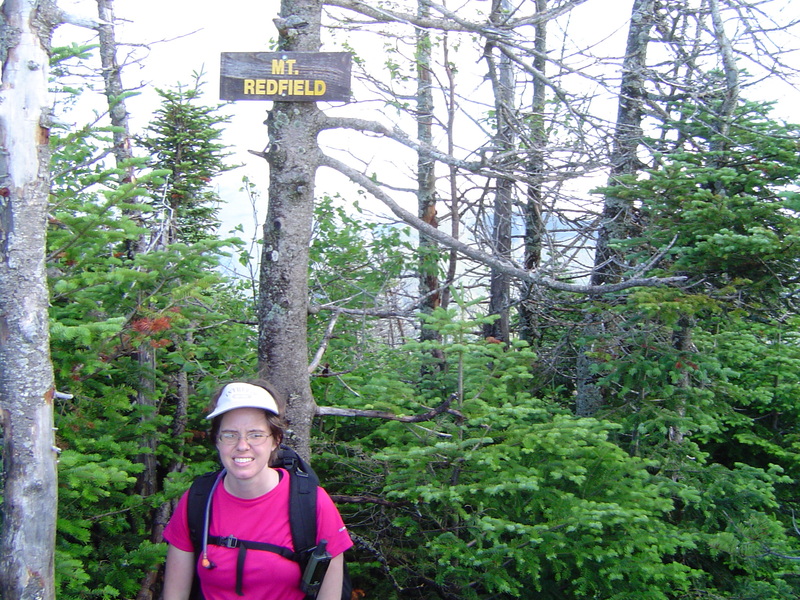 Redfield is the 15th highest peak with an elevation of 4606 feet. The day before had been wet and although the day was bright and dry the hike itself was close among the trees that were loaded with morning dew so that I stayed wet all morning. Kristy has some nice wicking tops and was able to keep relatively dry. 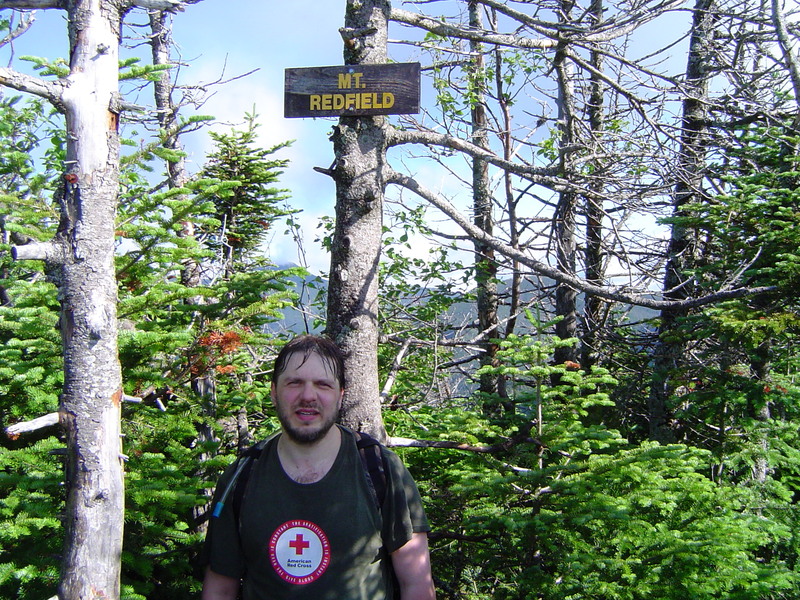 As high as Redfield is, the trees restrict the potentially awesome views of Algonquin, Iroquois, Colden, Marcy, Haystack, etc. (some of which are peaking through the trees behind us in the summit pictures) but there is a great view of Allen. Down Uphill Brook: Down, down, down. 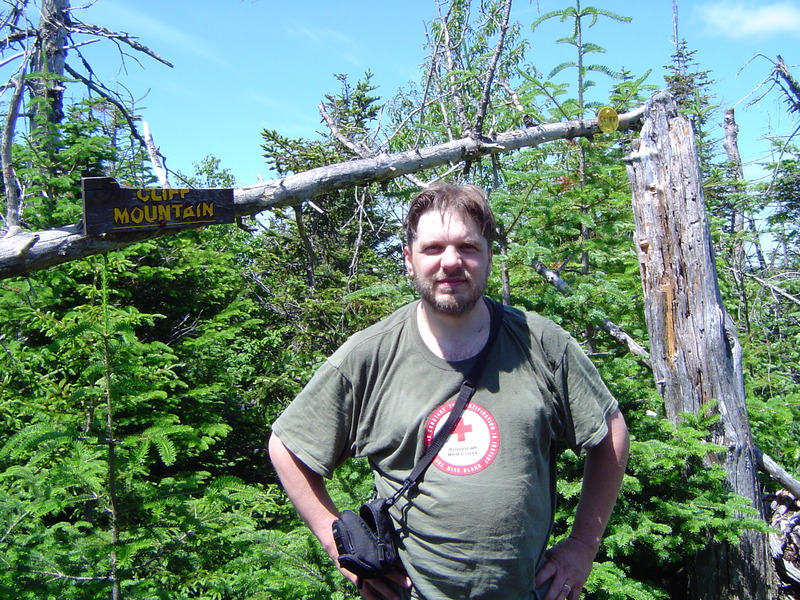 Some hikes are a lot of work up to a ridge that affords the summiting of a few peaks before heading back. Just for the record - in order for a peak to count it must be either a one-half mile separation from or a 250 foot vertical drop between it and the nearest recognized peak. 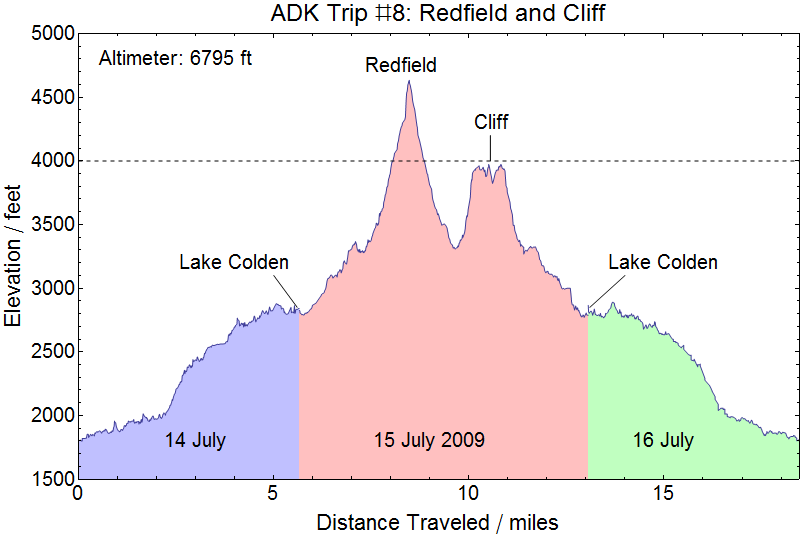 The vertical drop from Redfield to the col between it and Cliff (essentially the Uphill Brook trail head) is about 1400 feet. So climbing Redfield from the herd path trail head offered no headway toward Cliff. On the way down Redfield we ran into our LeanTo neighbor from the previous night heading up and learned that it was his bear canister that had been raided the night before. He sadly reported to us that although the bear had left him one good meal for the day he'd otherwise been cleaned out and was therefore changing his original plans to stay in for several more days and summit several more peaks to knocking off Redfield and heading straight out to the Upper Works parking lot. That's a hard lesson and that I hope he doesn't have to experience again! Cliff Mountain: Having worked our way back down almost to the Uphill Brook trail head we found the cairn marking the herd path to Cliff easily. Cliff is a much shorter mountain than Redfield (only 3960 feet, and therefore only a "4000 foot" peak by definition) but that doesn't mean the hike isn't a lot of work - especially after working all the way back down to 3300 feet! It's a steep climb to the false summit and Cliff comes by it's name honestly. There were two sets of cliffs along path that had to be negotiated. You don't go straight up the cliffs but via switchbacks and work arounds but there are definitely some decent rock climbs ranging from 5 to 15 feet that must be negotiated to reach the summit - well - the false summit! Did I mention that? You work pretty hard to make it to the false summit at 3950 feet. You then have more that a quarter mile of frustrating work to make the real summit a whopping 10 feet higher! The ADK46rs do some maintenance on the "unmaintained" trails. I have a suggestion... shave 6 feet of dirt off the top of Cliff and haul it over to the false summit!!! Back to the Opalescent Trail: After taking the rock scrambles and steep trail back down to the Uphill Brook trail head we headed back down the Opalescent Trail toward Lake Colden. The downward pitch didn't make the close branches or exposed roots crossing the path any less frustrating, but, again, not bad. 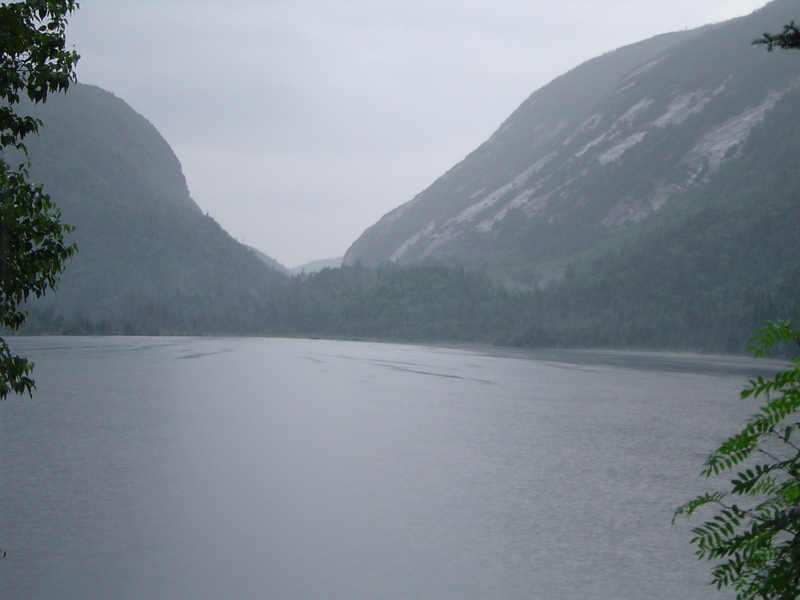 We were definitely able to appreciate some of the views of Algonquin and Colden briefly exposed along the way. If you make this hike don't miss the opportunity to enjoy the open rock along the Opalescent River heading down toward Lake Colden. 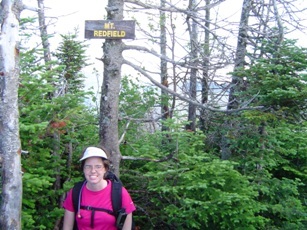 We ran into several women who had just summited Mount Redfield heading back down the Opalescent Trail. They were moving a little faster than us so we let them pass us. Shortly after that we came upon them enjoying a well deserved hot lunch on a large open rock surface beside a fall in the river. We took a 10 minute break to share our hiking stories and learned that they'd done Marshall the previous day and were all above 40 closing in on 46 fast. The day's hike was a good workout. 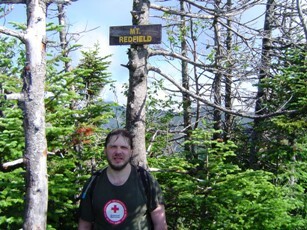 Redfield by itself from the Upper Works Parking Lot and back is rated A+ by the ADK. That hike includes the 5.5 miles from the parking lot to Lake Colden we didn't do that day, but it also doesn't include summiting Cliff which is probably a pretty reasonable replacement - so I guess that would be the day's efforts at about an A- or possibly an A. Back at the LeanTo: We arrived back at the LeanTo at about 1630 and enjoyed a relaxed afternoon of hot meals and beautiful views. With two more peaks under our belts, a generally enjoyable hike along the way, and truly excellent weather we were very optimistic about our plans for the next day. Our original plans, which we'd left flexible, were now pretty firmly fixed on heading up from Lake Colden to the col between Algonquin and Iroquois for a summit of Iroquois and possibly a return to Algonquin. We had missed Iroquois on our previous hike up Algonquin because of driving, horizontal rain slightly above freezing coming out of the Southwest (i.e., the direction of the ridge line to Iroquois). If you are an aspiring 46er and you summit Algonquin on a nice day - SUMMIT Iroquois AT ALL COSTS! The number of pleasant days on top of Algonquin in any given year is relatively small. Evening: About an hour before dark another hiker came through camp. He was on a sponsored trip for Eastern Mountain Sports and we had a really enjoyable evening talking about our hikes that day and plans for tomorrow. He originally planned to continue on to another site, but after visiting for a few minutes he decided to bunk down with us. Among other things, his sponsorship with Eastern Mountain Sports meant that he was expected to both advertise his sponsor and provide helpful advice to hikers. He did a great job at that including showing off his gaiters (which we purchased before our next hike to great benefit), cooking gear, prepared camping meals, ultraviolet water sterilizer, and other products. Unfortunately, we forgot his name and took the effort to visit EMS in Lake Placid and back at home in Northern Virginia to see if anyone knew his name and to give him a favorable report. If anyone reading this knows who he is please let me know! Onto Day 3: Over the course of the night the rain moved in... along with some electrical activity. By morning the electrical activity seemed to have calmed down a bit but the rain continued. 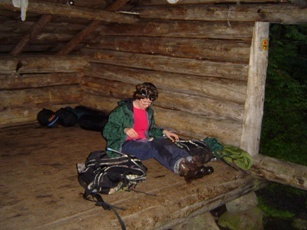 We were up at 0530 preparing for the hike but waited on the rain before hitting the trail. Breakfast was Pop-Tarts, as usual, which we ate leisurely while enjoying (?) the peaceful rain. There is a substantial bog between Algonquin and Iroquois which must be traversed to reach Iroquois and you generally don't want to do that in the rain. Also, the amount of open rock and very steep trail that come with summiting Iroquois and Algonquin from Lake Colden is enough that you don't want to do that in the rain either (remember my comment about our previous hike up Algonquin?). Last but not least, there was still some electrical activity in the area and, you know, it's probably not a good idea working on your best lightning rod impression up on a High Peaks ridge with lightning in the area! So after waiting until about 0700 I called the hike and we packed and headed back out to Upper Works. About half way out the rain stopped. By the time we got to our car the sky broke and we saw some Sun! 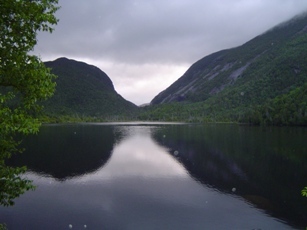 But all later views of Algonquin confirmed that the improved weather in the valleys that day was NOT reflected on the summit. Next trip: We might return this year for Rocky Peak, Iroquois, and Marshall. Or maybe Allen. Child stats: When Kristy was pregnant for Rachel we climbed 5 peaks: Macomb, South Dix, East Dix, Hough, and Dix (well, South Dix twice!). 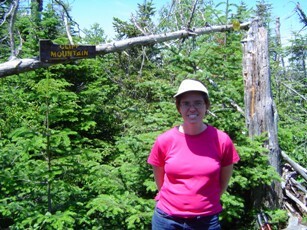 Kristy was pregnant this trip so the new baby has also climbed 2 peaks so far: Redfield and Cliff. Kristy is pushing strongly for a second trip this year after only making two peaks this trip (in part because the new baby currently trails Rachel by 3 peaks! ).